While doing some research before deciding to get my Cavachon, I found that it was very hard to find any real reviews or other information from actual owners of Cavachons. In order to help others better understand what to expect from the Cavachon breed, I have written a review based on my personal experiences with my own Cavachon! My male Cavachon, Kasey, has been a joy to own from the very beginning. In this review, I’d like to describe the transition from the breeder to my home, his overall temperament, his physical characteristics and how housebreaking went. Most reviews don’t cover all these things, so I want to share as much as I can. I hope some of you will also share your reviews on this page as well. As you know, general breed characteristics can be the same, but each dog is special! I’ve had him since he was eight weeks old and he’s just over a year old now, so I’ve watched him grow up! From the start, he has been easy going and lovable. As a case in point, I had him shipped via Delta Airlines from Iowa to my home in Ohio. The trip did not bother him in the least – in fact, when I opened the carrier, he happily scampered out to lick my face with his tiny tail wagging. He was relatively quiet during the first couple of nights when I first brought him home and it didn’t take too long before he was completely quiet during night (about 2 weeks). I kept him in a cage in my room during the night and occasionally, he would yelp to let me know to take him outside. During the day, I would block off the doors to my kitchen and move his cage there. That way I could keep an eye on him and not have to worry too much if he had an “accident” on the vinyl floor. I would leave the door to his cage open and he would “nap” in it when he was tired. All in all, the transition from breeder to my home went very smoothly. Kasey is a lovable companion. He follows me around the house and enjoys being with me. When I sit on the couch, he jumps up and curls uponto my lap. I go to sleep at 10 every night and if I am late, he is there waiting for me (a creature of habit, I guess !). Yes, I do let him sleep in my bed. He is generally quiet until he sees a squirrel in the back yard, then he’ll let out a loud string of “hey, get out of my yard” barks. He has a hilarious repertoire of grunts, moans, and growls that he uses to get my attention or beg for a treat. He is very intelligent. In fact, he knows the difference between some of his toys. When I say “Go get your ball”, he actually brings the ball back! He knows several commands including: sit, lay, paw and dance. Finally, he loves getting his belly scratched. As I mentioned earlier in the review, Kasey is just over a year old now. He weighs about 18 pounds and he is 14 inches tall at the shoulder. He has mostly white, curly hair. I take him to the groomer roughly every other month because his hair will grow quite long (3″) if left uncut. I like to keep his hair about 1″ long on his body and 2″-3″ long on his tail. He has very expressive dark brown/black eyes that just melt you when he looks at you. His ears are very long – an attribute from the Cavalier – that tend to drag on the ground when he is sniffing about. Despite the fact that Cavachons are very smart dogs, it still took Kasey quite a while to get the knack of going to the bathroom outside. It probably didn’t help that I moved when he was 6 months old. But now, at just over a year, he is almost completely trained. I taught him to ring a bell attached to the door when he wants to go out. A little warning for you…this is a great trick to teach your dog, but if you aren’t around to hear the bell, you will run into problems. You may just want to teach your dog to bark! I taught him to go outside by first taking him out regularly and giving him a treat when he went to the bathroom. If he had an accident in the house, I would immediately take him outside and reward him if he went out there. Overall, this is an excellent breed – these dogs make great companions who have tons of energy. I hope this review is helpful to you. Please feel to let me know if you have any questions. 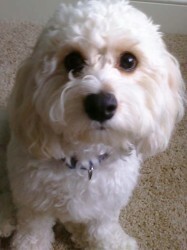 I have a male cavachon he will be 2 yrs in June. He is very lovable and adorable. However we are having seperation problems. Constant whining barking scratching and chewing anything that is available. Has anyone any suggestions please. We have 2 King Charles and the 11 year old died 2 months ago. I am thinking about a puppy in the spring and I am looking at the Cavachon. This blog was helpful. Both my dogs are on heart medicine which seems to be common. Hilo is 8 and he has been a great companion. Oliver is now nine years old….I cannot imagine a more adorable, loving and smart dog to anyone. He is bigger than they say one should be, 35 pounds of pure love. Everyone where I live stops to tell me how adorable he is and ask just what breed he is…many think poodle because of his curly, Bichon fur. He is both very intelligent and very stubborn but he is also a cuddler and he sleeps in my bedroom every night but not on my bed. Has anybody been dealing with their Cavachon having recurrent issues with bladder stones? My 5 yr. old cavachon had many bladder stones removed this May. It still seems to be a problem. She Hill,s CD chicken stew. many urine tests and lots of money! I have a 9 year old one that is still very active and happy. I am interested in having on but am concerned about exercise. How much do they need?. Recently had to have my English Springer put to sleep, she was 13.5yrs old. We real l y enjoy walking and was wondering how much exercise they can take with no ill effects. My Cavachon who is three years old walks with me 4-5 miles a day in one stretch with no issues. My family has a 4 year old Cavachon “Cooper “. He is the best . We love this little guy . He is social, great personality, smart as a whip and is protective and attached to his family . The whole neighborhood loves him . If anyone wants a Beautiful dog for their family. Cavachons hands down. My recommendation. Unfortunately puppy biting is a faze that every pup does through. It’s should pass. Most dogs who puppy bite are either feeling the feet or getting over excited some just play like that. To stop it …well it might just fade in its own as the puppy gets older but in a firm voice say “no”. If the puppy really young don’t be to harsh young dogs to respond well to negative vibes. Also be aware that he/she could be teething so getting some puppy teething cream might work and a chew toy as well. We just picked up Charlie! He was born April 12 of this year. He’s a rare reddish gold puppy and he’s adorable. My boys love him and that’s including my husband the did not want a dog. Charlie has been with us 4 weeks and he has slept though the night after 3 days. The potting training is challenging and the biting has been crazy. Any suggestions out there. Also he hates to be alone. We are mostly home all the time because we have our studio in our home, but when we leave…. He cry’s a lot…. Considering purchasing a pup from 4everpuppies, they sound great, and like their training philosophy. Wondering if anyone has purchased form them or any information to share? I am also considering them for a puppy and would appreciate any feedback. Where did you get your dog? I am looking for a Cavachon. Thanks. quiet,bouncy,cheerful,gentle,helpful,sporty and healthy like a true Cavachon.I love to play with my ball and to meet new people.I like too to be loved and to listen my story.I was an abandoned dog but I go on a open door and the girl who was there see a little black dog,with curly hair and brown eyes.She adopted me and feed me,give me to drink,play with me,let me sleep,bath me,cure me and love me.I was vaccined and washed,dryed,brushed,washed my teeth,parfumed me and gived me a red collar.I was so beauty and I go on so many adventures and walks,so I can’t remember! I have a 4 month old Cavachon who is very furry and it’s very hot here in the summer of the Central Valley in California. I want to get him trimmed short for his comfort and less maintenance but my groomer of my other dog (a cavalier) tells me I shouldn’t cut his puppy fur or it won’t shed and turn to his adult fur at 7-8 months. They have never trimmed a Cavachon before, by the way. Does anyone know if this is fact? Or can anyone tell me if they know of any cavachons having problems when trimmed earlier than 7-8 months? I got our Cavachon trimmed at 5 months and every month after that , she is now 9 months old ,no problem at all. Anyone have experience with Cavachon By Design in Tenn.? Thank you. Yes, the owner is Yvonne and she is friendly and helpful. The pup we bought form cavachon by design is beautiful and has a sparkling personality. No complaint abut the dog, but follow up contact by breeder to see how dog is doing was non-existent. to bite Visciously, why would that be and what can we do to stop him? wow where did you buy him from? Your dog is actually teething just like a baby. It’s adult teeth are probably coming out. You need to scream ouch so that your dog will understand that he is hurting you. Continue with this so the dog will know in the future not to bite you or anyone else. It sounds like this is your first dog. The best thing to do is buy a book on training your dog. If you need an answer in a hurry about your dog, the best thing is to google your question. You would be amazed at the power of googling. A thing to do is to also is to socialize your puppy with other people and other dogs. You’d be surprise how many people out there walking their dogs and saying their dog is snappy or not very sociable. The main reason is that they did not socialize their dog when it was a puppy. Make sure the puppy meets the young and elderly, elders with canes, wheelchairs, skate boarders, bicycles, men with beards, etc. If a child wants to pet him, ask the child to approach him slowly and to let the puppy sniff their hand. This makes the puppy feel more comfortable because puppies usually don’t like sudden moves. The more exposure you give your puppy, the more enjoyable your walks will be with him. Thank you this was very helpfull! Foxglovecavachonpuppies.com. We just got our cavachon puppy from them in October. We have five kids and two cats. He gets along with everyone. A great dog to have. We went on the internet and found our dog through Cavachonpuppies.com. The breeder Vicky lives in Bloomington, Indiana. Check out the website even if you do not plan to purchase there. The breeder invites anyone who is interested to visit her and the puppies. We got our Cavachon from Vicky when he was 8 weeks old. Our dog is now 8 years old and he is the sweetest dog. Everybody who sees him falls in love with him. He loves to give everybody kisses. He walks really fast when he sees a person walking with a dog just to catch up, once he reaches that person, he pretends to greet the dog. But what he really wants to do is get the attention of that dog’s owner so he can get his belly and ears rubbed. We’re also getting our reserved puppy from cavachonpuppies.com. We have been emailing with her and she’s so nice. She kindly answers ALL the questions we ask. I recommend her to anyone getting a cavachon puppy! Hope this helped! Our Cavachon is 8 yrs old now and still has the I want to sit when on a walk. What we do is when he lays down, we pick him up, walk a few steps, put him down and start running him for a little bit. We eventually get back to our normal walking pace and he just forgets that he wanted to lay down. The best thing to do is not fall into the treat thing when he doesn’t want to walk. He will always continue to look for that treat and lay down because s/he has you trained now to offer that treat. How do I know? We gave the treats ourselves and we had to train ourselves to not do that. Our trick is to give our dog a ball with treats in it when you leave. Our Cavachon is too busy pawing and barking at the treat ball. He won’t even noticed you walked out the door.